Justice is everyone's concern.In the workplace, it plays a critical role in organizational success and promotes the quality of employees' working lives. For these reasons, understanding the nature of justice has become a prominent goal among scholars of organizational behavior. As research in organizational justice has proliferated, a need has emerged for scholars to integrate literature across disciplines. 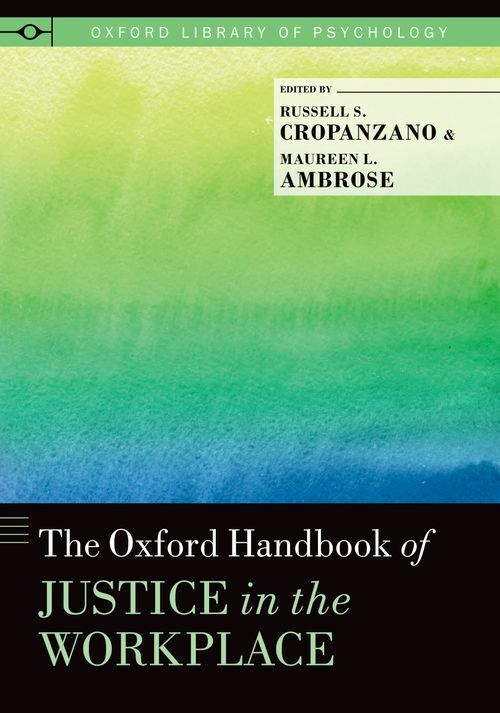 Offering the most thorough discussion of organizational justice currently available, The Oxford Handbook of Justice in the Workplace provides a comprehensive review of empirical and conceptual research addressing this vital topic. The chapters provide cutting-edge discussions of performance management, conflict resolution, diversity management, organizational climate, and other topics integral for promoting organizational success. Additionally, the book explores major conceptual issues such as interpersonal interaction, emotion, the structure of justice, the motivation for fairness, and cross-cultural considerations in fairness perceptions. The reader will find thorough discussions of legal issues, philosophical concerns, and human decision-making, all of which make this the standard reference book for both established scholars and emerging researchers. Organizational Justice and Legal Justice: How Are They Related? Justice and Deonance: "You Ought To Be Fair"
Dr. Russell Cropanzano is Professor of Management and Entrepreneurship at the University of Colorado, Boulder. He has published over 120 scholarly articles and chapters. Dr. Cropanzano was a winner of the 2000 Outstanding Paper Award from the Consulting Psychology Journal, the 2007 Best Paper Award from Academy of Management Perspectives, and the 2010 Best Paper Award from the Journal of Management . He is a past editor of the Journal of Management and a fellow in the Academy of Management, the Society for Industrial/Organizational Psychology, the Southern Management Association, and the Association for Psychological Science. ; Maureen L. Ambrose is the Gordon J. Barnett Professor of Business Ethics in the College of Business at the University of Central Florida. She has published broadly in the areas of organizational fairness, workplace deviance, and ethics. She is an Academy of Management Fellow as well as a fellow of the Society for Industrial and Organizational Psychology and the Association for Psychological Science.